SRINAGAR, FEB 10 : Hundreds hailing from all walks of life participated in daylong Seminar organized by AIP at Sopore today to pay homage to Mohammad Maqbool Bhat and Afzal Guru on their anniversaries. Those who spoke on the occasion included Mufti Nissar Ahmad, Prince Parvez, Malik Tariq Rashid, Sheeban Ashaie, Advocate Sajad and Advocate Noor-ul-Shahbaz. Speakers called both the hangings as judicial murders and politically motivated. Speaking on the occasion Er. Rasheed asked New Delhi to introspect and tell Indians how has Maqbool Bhat and Afzal Guru’s hangings helped Indian state. Er. Rasheed said “While New Delhi has a history of broken promises, it was Maqbool Bhat’s hanging, not alleged rigging in 1987 elections that persuaded youth to pick up arms. Those claiming 1987 rigging as reason for start of armed insurgency are distorting facts. Maqbool Bhat’s hanging made Kashmiris to believe that New Delhi does not want to resolve Kashmir dispute and has decided to bulldoze all those voices who would seek resolution to Kashmir dispute. In fact Mqbool Bhat’s hanging was aimed to terrorize Kashmiris but New Delhi had a huge miscalculation and his hanging proved counterproductive. By denying the mortal remains of both Maqbool Bhat and Afzal Guru New Delhi not only confessed its guilt but its claims of being a state believing in non-violence proved fake”. Er. Rasheed appealed people of India to understand that hangings have deteriorated the situation further and whatsoever destruction has taken place in J&K and elsewhere has a direct connection with the hanging of Maqbool Bhat and most unfortunate thing was that rather taking lessons from Maqbool Bhat’s hanging, New Delhi repeated the mistake and hanged Afzal Guru too, which led to further disappointment among youth and second phase of militancy started in Kashmir. Asking New Delhi to respect the sentiments of people of J&K Er. 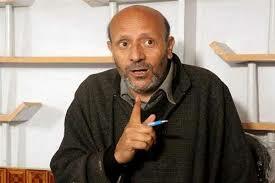 Rasheed appealed for return of mortal remains of both the martyrs and reminded New Delhi that for Kashmiris and all peace loving people neither Maqbool Bhat nor Afzal Guru were terrorists but whatsoever happened with them was travesty of justice and the hangings were nothing but judicial murders. He said if New Delhi believes in Rule of Law then one has a right to ask that why not even a single men in uniform could be hanged like Afzal Guru or Maqbool Bhat as how it is possible that everyone who killed Kashmiris would be innocent. Appealing for unity among Kashmiris Er. Rasheed asked pro-resistance leadership to broaden its consultations and try to strengthen pro-resistance voices, as the fight between Kashmiris and New Delhi is bigger than our personal interests and egos.